The Border Terrier is a small, medium-boned sturdy dog. The shoulders and body are narrow. The space between the eyes is relatively wide. The muzzle is short and usually dark, with a slight, moderately broad stop. The nose is black. The teeth are strong with a scissors bite. The small ears are V-shaped, set on the side of the head, dropping forward close to the cheeks and are usually dark in color. The medium-sized eyes are dark hazel in color. The front legs are straight and not too heavy. The medium-sized tail is thicker at the base and tapers. Border Terriers have a short, dense, wiry double coat that comes in red, grizzle and tan, blue and tan, or wheaten. There may be a small amount of white on the chest. A dark muzzle is desired in the show ring. The Border Terrier is an alert, bold little hunter. Very agile, it is willing to squeeze through a narrow space to capture any quarry that may be on the other side. Lively, they enjoy playing with children. Affectionate, mild-mannered dogs that aim to please their owners makes them easy to train. This sturdy, scruffy, little terrier is a good watchdog, and may bark, but is not aggressive. Be sure to socialize them well. Puppies should be made accustomed to loud noises while they are still young to avoid excessive timidity. Puppies and adolescent Border Terriers are very active, but will mellow as adults provided they get plenty of exercise. Border Terriers like to dig; it is a good idea to install additional reinforcements along the bottom of fences. Good with family cats if socialized with them, however this hunting terrier has strong instincts and should not be trusted with non-canine pets such as hamsters, guinea pigs, rabbits, and birds. Be sure you are always your dog’s firm, confident, consistent pack leader, to avoid Small Dog Syndrome, and separation anxiety. Prone to Canine Epileptoid Cramping Syndrome (CECS), also known as "Spike's Disease." This is a recently recognized canine health problem and hereditary canine disease in Border Terriers. It can sometimes get confused with canine epilepsy. It is also being considered to be a metabolic, neurological or muscle disorder. The Border Terrier will do okay in an apartment if it is sufficiently exercised. 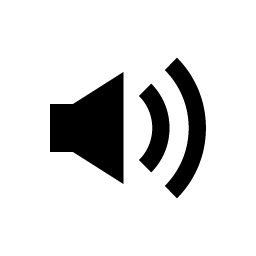 They are moderately inactive indoors and a small yard is sufficient. 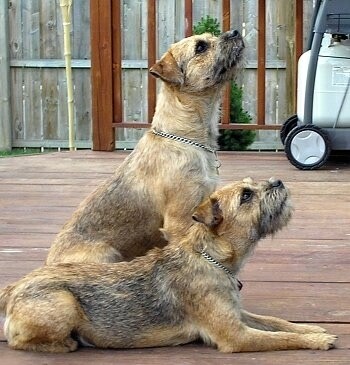 Border Terriers were bred to hunt and have great vitality and stamina. They need plenty of exercise, which includes a long daily walk. The durable, wiry coat needs to be brushed weekly and professionally groomed twice a year. The object is a completely natural look. The Border Terrier sheds little to no hair and is good for allergy sufferers. Bathe only when necessary. It was in the Cheviot Hills near the border of England and Scotland that the Border Terrier was first bred. 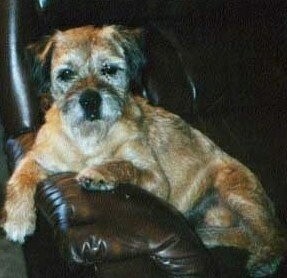 The breed is possibly one of the oldest types of terriers in Great Britain. The farmers had problems with foxes killing their stock and the Border Terrier worked alongside them to drive the fox out of their dens and kill them. They were small enough to follow a fox into the ground but big enough to keep up with the horses. The dogs were often not fed by the farmers in hopes it would make their prey drive even higher and they had to hunt to survive. Along with fox they hunted otters, marten, the fierce badger, mice and rats. Today while the Border Terrier is mostly a companion dog, he can still serve as a fine farm dog, helping to control vermin. 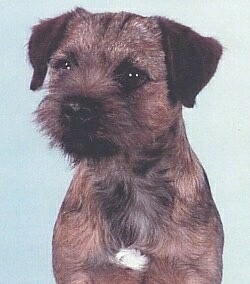 The Border Terrier was recognized by the British Kennel Club in 1920 and by the American Kennel Club in 1930. Some of the Border Terrier's talents include: hunting, tracking, watchdog, agility, competitive obedience and performing tricks. BTCA = Border Terrier Club of America, Onc. Hamish the Border Terrier at 6 years old, but still a puppy at heart, and as you can see enjoys his cat naps. Hamish is Tyler's son (Tyler pictured above). American and Canadian Champion KayLee's Run for the Border, Master EarthDog aka "Jake"—Jake is owned and spoiled rotten by Lee and Kay Anderson of Shady Cove, OR, USA.